Petr Yudin is writing on the Svbtle network. Hello everybody, I am back with another ICO review, this time I am reviewing OneLedger. OneLedger is meant to be an interoperable blockchain, focused on corporate applications., with a master smart contract written in all major languages to be able to function cross-chain, i.e. use One Ledger to use all of the ledgers :-) Unlike other crosschain platforms (Polkadot, Cosmos, Block Collider etc. ), OneLedger seems to be focused on corporate clients, which can access the benefits of blockchain more easily. Cross-ledger, blockchain agnostic protocol, based on sidechains - transactions are credited off the main chain to enable scalability. Hi crypto community. I am going to cover yet another exciting project. Arweave is a decentralized data storage and sharing platform, comparable to Filecoin, MaidSafe, Storj, Sia and IPFS. mainnet - just after ICO - right now coming up in 13 days. Compare that to Filecoin, which has been announced long time ago, but still has no product. Testnet has been in place for quite some time. Disclaimer: I am not certified financial advisor, and this is not financial advice. Quarkchain… the new, scalable, two layer & reshardable blockchain everyone is talking about! The website and whitepaper got me interested. I first did my own research. You should also #DYOR. After you do it, you might find the below useful. I aggregated research results of major reviewers I could find. An outstanding score of over 90%. 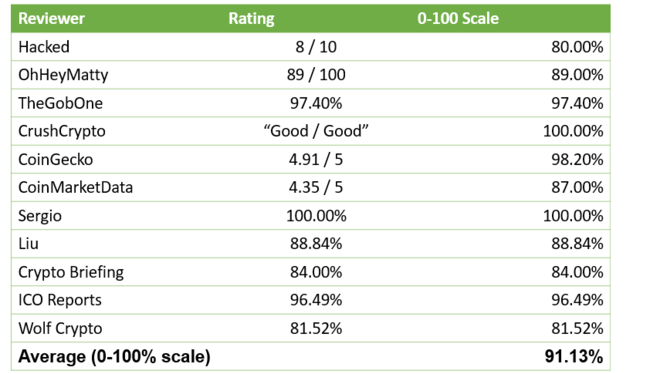 Overall, the reviewers love Quarkchain, with an average score of over 90%. *type of project — own blockchain attempting to store scalability, which also makes token economics great.